So, in case you wanted an update on how I am doing with my summer to-do list, I have tried a few new restaurants. For example, I tried a new Thai place that is just on the other side of this white wall I am standing in front of. (Quite frankly, it's been way too hot here to do much more than that!) My husband and I tend to go to the same dozen or so restaurants over and over again, which is why it's fun to try out new places. Plus, now that I am on summer vacation, we can reap the benefits of the weekday lunch specials that aren't often offered on weekends! I know this makes me sound really cheap, which in many ways I am, but whatever I save I can spend on new handbags, shoes, and clothing! Like restaurants, I find that my wardrobe also tends to get into ruts as well, especially around summertime when the excessive heat means prioritizing function and comfort over style. I am also prone to gravitating to similar prints over and over again, like this floral one from J. Crew. I wore it on my blog last month when I bought it as a new arrival. Now that it is on sale, I am sort of bummed that I didn't wait longer for it, but I have been able to get a fair amount of use out of it in the meantime. I am actually contemplating buying the dress version of the print now that it's on sale. In fact, it's in my shopping cart as I am writing this! I tend to stick to the same restaurants too. That is a really great print the dress version looks really cute too. Beautiful!! Your skirt is just gorgeous! The print of your skirt... LOVE! The colors are great, and it's perfect with the pink checked shirt too. I love to try new restaurants, but we also tend to get stuck in a rut of eating at the same handful, so it's always fun to branch out! 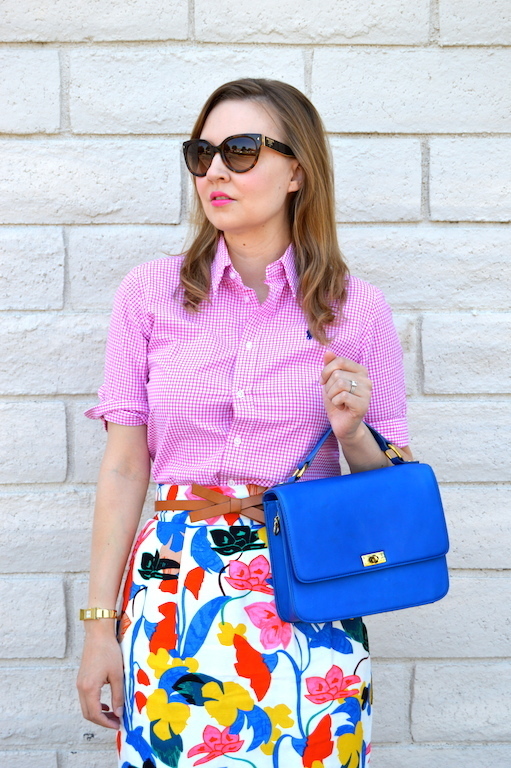 What a fun way to mix prints! 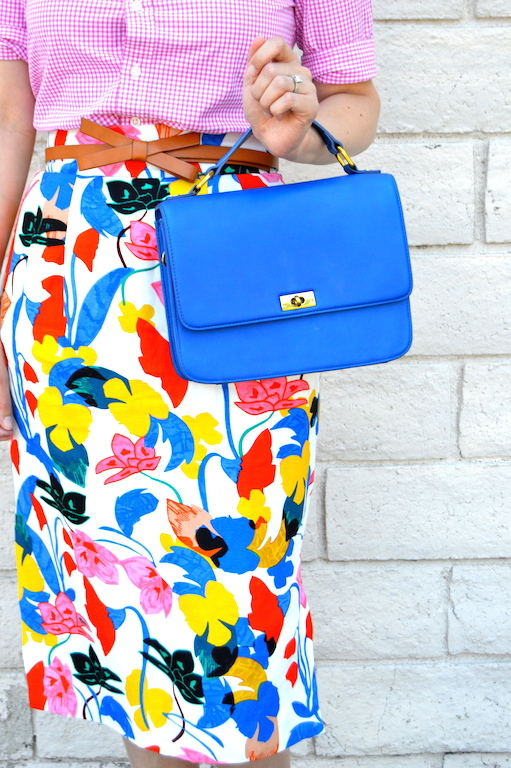 I love thos print and color combo! 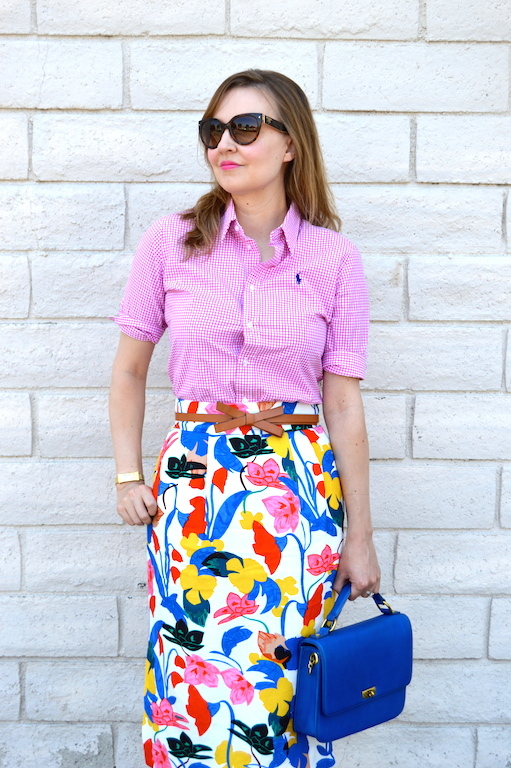 Such a polished look and the vibrant prints on the skirt add so much fun to the full look! You are the color and pattern mixing princess! OMG that skirt is amazing!! The colors in it pop so great in photos - I can only imagine how wonderful it looks in person! The print in that skirt is way too fun. Great bag, too! YASSSS I love the print on print look! I totally know what you mean, I live in a huge city and I just go to the same 6 restaurants over and over again! But there is something nice about going somewhere you know you like right? Wow!! The print of the skirt is so amazing, bright and fun. 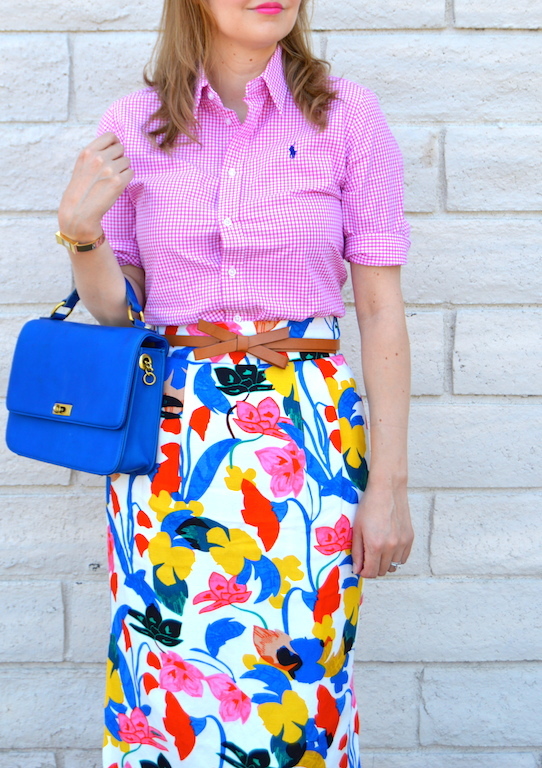 I absolutely love it paired with the pink gingham. Great combo. Have a great weekend. We'd love for you to stop by the blog and join our Tuesday Fashion Party Link Up. It's every Tuesday. I just put the dress on my wishlist. I'm thinking it would be an amazing first day of school outfit! That skirt! Such an amazing print! Love this outfit.